Sowing seeds is the most economical wayof growing our own food and if all goes well the rewards are both tasty and nutritious. Seeds are often tiny and the plants that grow from them begin life as nothing more than a shoot and a pair of leaves. These small beginnings to our fruit and vegetable plants need a good start if they are to grow strong and become productive. Often we sow directly into our garden soil – which is always preferable - but there are times when seeds have to be started off in trays and punnets. Starting seeds off in the right growing medium is crucial to their ongoing success and so we use seed raising mix. Once these seeds have germinated and produced several pairs of leaves the resulting seedlings can need to be transplanted and grown on in larger pots until they are ready for the garden – as is the case with tomatoes, aubergines and early crops of cucumbers and capsicums. When seedlings are grown into young plants in this way, they are planting into potting mix. Commercially made seed raising and potting mixes are sterile and weed free so seeds and seedlings can develop un-hindered. Seed raising mix is a gritty mixture of soil particles, organic material and fine drainage components. These are combined into a growing medium that allows adequate drainage, holds onto moisture and at the same time stays open so that delicate roots can move easily through it. Potting mix has a larger proportion of organic material than seed raising mix. It holds onto more moisture and has higher nutrient levels to sustain developing young plants. It is fairly light and compacts down if handled too heavily. Particles are still fairly small so that young roots can easily find their way through it. It is useful to havea bag of seed raising and potting mix to hand at all times. 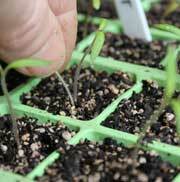 There is always a bit of a rush in late winter and early spring when sowing seeds and transplanting are happening in earnest. Keep bags of seed raising and potting mix in a dry place so that they stay dry don’t get soaked. Not so easy to use when damp. Application seed raising and potting mix are added to trays, punnets and pots. They don’t usually need any extra drainage material. 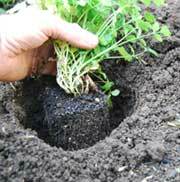 Handle gently and try not to over-compress them as this can make it hard for delicate roots to spread within them. You may end up with stunted seedlings as a result. Often just pouring your mix into the designated container and then gently shaking from side to side causes seed raising and potting mix to settle enough for sowing and planting.